Reporting is an important part which is automatically prepared by the Tally. ERP 9 software. Did you know you can easily view and print voucher wise reports in day book of Tally ERP 9? You can not only view, print, email but also export voucher wise reports from day book in Tally.ERP 9. Most of the person have to use day book to view or print day wise and voucher wise transaction of specific period. By default last date of entries are shown by the day book in Tally.ERP 9, but if you want to view all entries of specific period then you can use Alt+F2 (To change the period) option. If you have updated version of Tally.ERP 9 then you can easily get the benefit of different interesting features. Tally.ERP 9 is widely used in different countries due to his interesting and useful features. Professional version allows you to use sms feature, change default company to load itself, search particular amount wise report and many more in Tally.ERP 9. If you want to get better control during working on the Tally.ERP 9 software then you must have to know about the shortcut keys of Tally.ERP 9. These shortcut keys reduce your working time and increase the working speed on the Tally.ERP 9 software. The Day Book displays all the transaction made in a specific date and by default displays all the entries which is made in last voucher entry date. You can easily change or set the period to view or print all the entries which is made in different vouchers. Most of the professional person want to know how many entries are done in different vouchers with in a single day. In that situation you must have to take help of Day book in Tally.ERP 9. 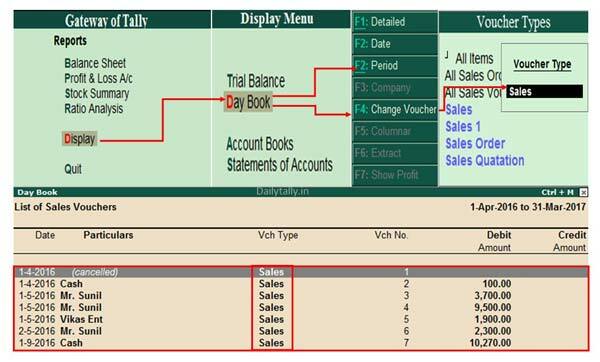 To view and print voucher wise reports in day book of Tally ERP 9 you must have to take few given simple steps. Step 1: Open an existing company in which you have number of records. Step 2: If you want to view and print voucher wise reports in day book of Tally ERP 9 then first active the day book in your active company. To active or view the day book go to the Gateway of Tally (GOT) > Dispaly > Daybook. Press Alt+F2 Tally shortcut key to set or change the period. Step 3: You can check entire voucher wise list of specific period is shown at your screen. Now you can easily extract day wise voucher entries by pressing the F4 key to change the voucher. Select any specific voucher from the list which entries you want to view or print and press enter key. Now, you can view and print voucher wise reports in Day Book of Tally ERP 9. You can also export day wise report in ASCII, Excel, HTML, JPEG, PDF or XML formats. I hope this guide is useful for all those novice users who want to learn Tally.ERP 9 and want to become a professional Tally user. If you have any suggestion regarding this guide then please write us your suggestion regarding this guide in the comment box. Thanks to all.